And while it falls short of a cruise-guided missile, the new Senza 226 has enough rocket-like qualities to ensure the good guy always gets his man. Released in the United States last September, the Senza 226 is the largest of the Senza family of five new models, all marketed at the top end of the US sports bow-rider range. With an optional "Adrenaline Package" for those in a rush, initial customer feedback suggests the new model is living up to its billing as a boat that is as "cool as ice and hot like fire". 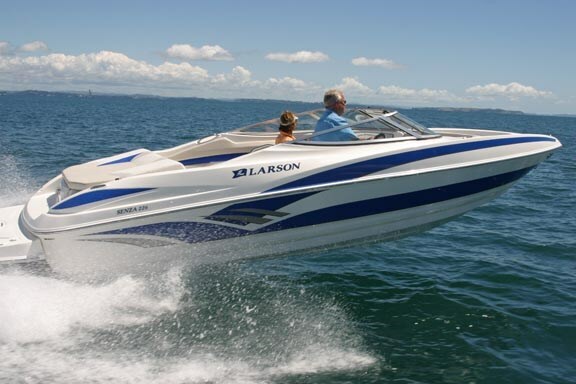 While still in its infancy as a brand in New Zealand, Larson Boats is part of Genmar International, a huge US-based boat building conglomerate representing 14 major brands including Four Winns. Genmar introduced the revolutionary closed-mould computer-monitored building process known as Virtual Engineered Composites, or VEC technology. While VEC construction speeds up the building process and, it is said, provides greater precision than traditional hand-laid construction, the company backs its boats with a limited lifetime hull warranty.Founded in 1913, Larson Boats is based at Little Falls, Minnesota, on the banks of the Mississippi River. Historically, the company is credited with building both the first glass-fibre trailer boat and the first outboard-powered trailer boat. 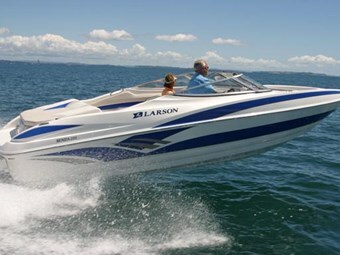 Today Larson employs 850 staff and builds 7000 boats a year across 24 models ranging from 18 to 37 feet. The company was also a first to attain the ISO 9001/2000 quality-assurance rating for both its construction techniques and its customer services department. Designed principally as a lake boat for the US market the Senza 226 is both strong and large enough to put to sea in moderate conditions. It is a boat that drives and handles as well, if not better, than some similar-sized trailer boats designed for salt water conditions. But make no mistake, the Senza is not a multi-purpose machine. 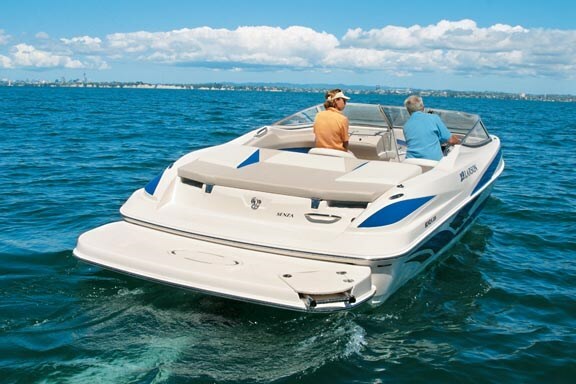 It is designed as a day boat with a strong emphasis on high-speed performance and comfort, both of which are largely dependent on smooth conditions. If things do cut up rough, though, the Senza has enough integrity to get you home safely. Importer and New Zealand Genmar agent Peter Rachtman sees the boat filling a niche at the top end of the bow-rider market and chooses to describe it as the BMW or Audi equivalent on water. "It’s all about style and hard-edged design. It has the sort of features and built-in luxury that European car manufacturers rely on to sell their next model. It is a boat that says something about the buyer." And there is little doubt the sporty Senza cuts an impressive image on the water. Low, sleek and purposeful, it demands a second look as it flies past the Rangitoto lighthouse on Auckland Harbour and brings up the stern of our photo boat on a picture-perfect February morning. Once onboard, the boat has all the feel of a sports car. The full one-piece moulded cockpit liner is flawless with clean large-radius curves that incorporate the console and seat bases with no sign of a single fastener to hold it in place. The U-shaped cockpit settees meld seamlessly together giving no clue that beneath lie twin storage lockers large enough to gobble up safety essentials like lifejackets and flares. A large locker is built into the central cockpit sole for the likes of water toys and skis, and a small moulded table drops into a floor-mounted well when required. Stereo speakers, moulded drink holders and recessed floor-level courtesy lights abound. A factory-supplied chilly bin is located under the central stern seat and is secured in a purpose-built locker moulded into the cockpit sole.The driver and passenger seats rival the best in automotive design with large thigh supports that hinge back into the seat to provide a higher sitting angle. Both chairs swivel through 180 degrees to face the rear cockpit lounge when at anchor. The "Adrenaline Package" fitted to the test boat provides the driver with fog-free Faria analogue engine instruments and include a digital depth sounder, CD remote control, speed (MPH), engine temperature, oil pressure and engine tachometer. The sports steering wheel is flanked by switches for the bilge pump, engine trim, courtesy lighting and a 12-volt utility socket. Opposite, the passenger enjoys the same level of comfort with a moulded glove box set into the dash housing the CD stereo. The helmstation is separated from the bow seats by a close-fitting, tailor-made anodised aluminium windscreen that is carried well aft to protect rear passengers from wind and spray. A hinged central pane folds back at rest giving easy access to the bow seats and lockers. With seating for seven, the Senza falls firmly into the ranks of a family-friendly boat. A feature of all Larson designs is an oversize swim platform and the Senza is well served here too. The platform houses a telescopic swim ladder and is a perfect place to wet a line if conditions allow. The engine hatch forms the lid of a large richly upholstered sun deck where a couple could spend many happy hours working on a tan or a good book. The transom features a remote for the stereo and, somewhat oddly, a remote for the engine trim. Polished stainless steel is a feature of the boat with recessed mooring bollards fore and aft, stainless hand-holds on the transom and in the cockpit and a stainless rub-rail moulded into the hull-to-deck join. The bow contains three further under-seat lockers and enough leg room in the central well to be useful. On the down side, the Senza is not fitted with a bow roller and has clearly not been designed to carry or use an anchor – an essential item for owners planning to put to sea. While a bow roller could be retro-fitted, it would mean relocating the dual port/starboard navigation light mounted amidships.Engine access on the Senza is simple and sensible with the large aft sun deck lifting on twin gas struts to give excellent access to all the boat’s running gear and bilge pump. 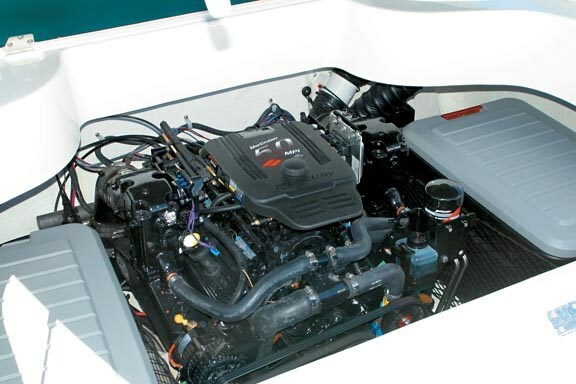 The factory installation of the MerCruiser five-litre 220hp MPI V8 petrol engine is workman-like and clean. Various engine options are available factory-direct ranging from the standard 220 MPI through to the 300 horsepower 350 MAG MPI. The Senza 226 is nothing if it is not a driver’s boat and the driver’s seat is the only place to be mid-week when the only traffic on the gulf is two America’s Cup yachts duelling in the light nor-easter. Once behind the wheel one immediately looks to adjust the rear view mirror, which of course is a nonsense. With the V8 barely audible at idle one can’t help but sense something big is about to happen when the ponies kick in. With the leg trimmed and power on, the Senza instantly leaps onto the plane, the V8 begging for more as the boat pushes through 35 knots in less time than it takes to wipe a tear from the eye. This is indeed a driving experience. The windscreen does a faultless job of looking after the Senza’s occupants and it is easy to forget your speed from the wheel. With a touch more throttle we break through 38 knots but button-off through respect for the owners and their brand new boat. But does it go around corners? Short answer, yes – but hold on to your glasses – the Senza is one spirited campaigner. At a fast cruise of 32 knots the boat feels sure-footed and responsive. The one-piece hull liner and solid glass hull combine to give a rattle-free ride with hardly a trace of chine slap. The hydraulic steering is positive but light and the hull super-sensitive to leg trim. The wake exits the hull well aft and the oversize swim platform all but prevents any spray finding its way back on board. With the leg trimmed fully in the Senza is surprisingly manoeuvrable, both in forward and reverse and should provide no difficulties berthing or driving onto the trailer in windy conditions. The Senza is indeed "cool as ice – hot like fire" but with the simple rider that would-be owners don’t push the boat beyond its design parameters. The Senza is first and foremost a lake boat – the lack of a bow roller tells us that. And while it will cope admirably at sea in slight conditions and get you home in moderate conditions, that is not what the Senza is about. It is about fun, family, eye-popping performance and head-turning style.